Ms. Agnes Owusu executive member of the party in Central Region has called on executives of Gomoa West branch of the party not to lord their positions on the members but rather team up with them to achieve goals. She said this will enable them receive fruitful ideas, suggestions and information from them to execute their mandate for the party to win the 2020 elections. 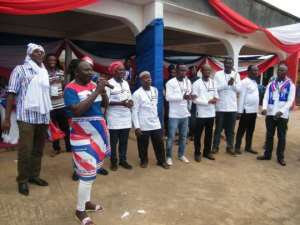 Ms. Owusu made the call when she led a team to observe and supervise the Gomoa West branch of the NPP annual delegate's congress and election of their new executives. The elections were conducted by officials from the District Electoral Commission (EC) directorate led by Madam Loretta Lattey, the district officer. Mr Ernest Kobina Quaye Chairman, Mr. Abass Kojo Acquah first Vice Chairman, Mr. Richard Agyernim Boating second Vice Chairman, Samuel Deku-Otoo Secretary, Michael Assan Youth Organizer, Albert Kojo Essel Treasurer, Ms. Georgina Offei Women's Organiser and Yusuf Essuman Nasara Coordinator all went unopposed. The position of Assistant Secretary was contested by three people and Mr. George Alexander Sarfo polled 434 votes to beat his contestants while Mr. Frederick Adu Quaye had 362 votes out of the total valid votes of 689 to become the organizer. Later Ms. Owusu led executives to take the oath of Office and allegiance and also sworn them into office. She expressed gratitude to the delegates for the mandate to the executives to lead the party for the next four years and urged them to bury their differences and rally behind them in accordance with the party's rules and regulations to win the 2020 elections. Mr Quaye the branch party Chairman thanked the delegates on behalf of the entire executive for giving them the opportunity to serve the party saying 'We are there for all the members of the party and pledged to work with all and sundry to win more members into the party since winning elections is by numbers'. In an interview with Ghana News Agency Mr. George Alex Sarfo Organizer elect, a former chairman of the branch party commended the delegates for the honour done him, and promised to use his rich expertise in the day to day programmes and mobilisation of the members towards the victory of the party in 2020 Parliamentary and Presidential elections.